Sumatra wrapper very veiny with dark splotches 6x48 triple capped. The smell of peppermint is evident similar to the Tatuaje P or Boris which seem to share the same wrapper. Initial light is all Sumatran wrap with a peppermint zing. Front sides and front half of the tongue denote a peppermint bite. Some cedar comes to the party throughout the nose. First inch doesn't deviate much from the peppermint and cedar. Peppermint begins to settle and a dryness settles in the mouth. The finish is long. Creamy yet dry. My tongue is coated which leads me to believe the peppermint flavors are overwhelming the cigar. Starts with a chocolate note which does seems to cut the mustard a bit. This reminds me of the Tatuaje P but more so the Boris. Very nice now with some bite in the throat. A leather chewiness noted as I work through the finish which is long. Wow the mint really hits after the half way point. .
Much stronger than the Series P the peppermint doesn't let up which makes this a bit one-sided. Then, with no warning, I get a coconut almond flavor that just hit me. Which hits the brakes and takes a left turn down a side street. It's here then gone. Leather comes back just enough to spanks your taste buds. Flavor goes full strength. Nice review. Was thinking about grabbing some of these. Lets see what the wifey allows for tomorrows fathers day gift...lol. Is this an infused cigar? If not, what's your guesxplanation behind the peppermint taste? The wrapper is my best guess since that is the similarity in the Series P and Boris. 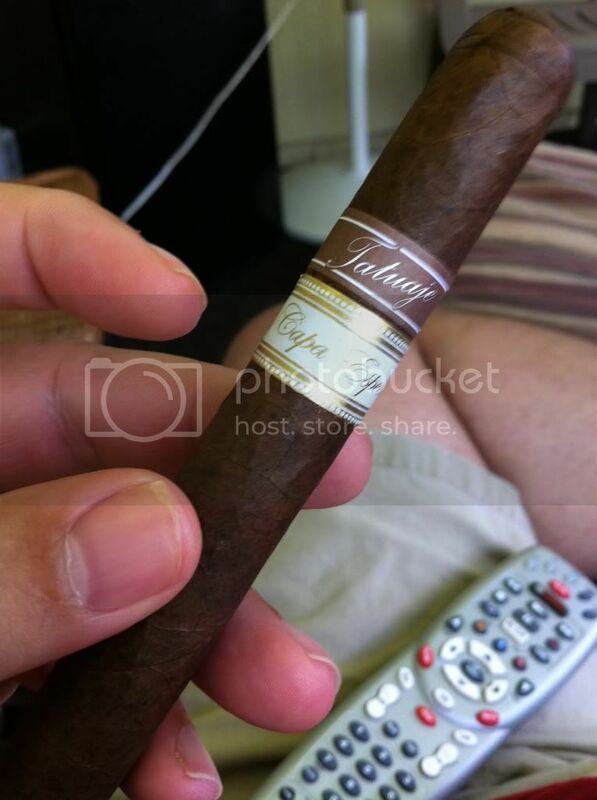 I do not think that any Tatuaje's are infused. It seems like the pepper spice is mostly associated with his blends just more of a tea leaf bitterness, which for me reflects as a peppermint note. Reminds me of the back note of an Altoid. A chauky aftertaste after eating an Altoid. It is more of a reflection than an actual flavor. At least that is my guessplanation. This will be a regular production cigar. Not sure how the Fausto will pan out. He will most likely go longer on the fermination process which is gaining popularity but will increase production time and cost. Ok, just did some reading up and the Fausto is similar blend to the T110. Can you PM me where you got this from? Thanks! Fausto is the T110 blend, in different sizes. The Capa Especial uses the same wrapper as the Series P, which is an Ecuador Sumatra wrapper, the same origin/seed as the Boris wrapper, hence the similarity. Looking forward to mine arriving. ...hmmm, I tried one of these and remember more of a dominant flavor more like grahm cracker or ginger bread once the first inch of pepper power went away. Still it was very nice as are most tatuaje cigars.